The sheer, curved glass façade of the library will serve as a ‘gorgeous dance wall’ for BANDALOOP eight times June 21-24. (Photo courtesy of BANDALOOP) Oakland, Calif.-based “vertical dance” company BANDALOOP will be appearing at the Utah Arts Festival June 21-24, and will perform twice daily (5:30 and 7 p.m.) on the six-story library glass wall above the reflecting pool. (Photo courtesy of Basil Tsimoyianis) Oakland, Calif.-based “vertical dance” company BANDALOOP performs in Sydney, Australia. They will be appearing at the Utah Arts Festival June 21-24, and will perform twice daily (5:30 and 7 p.m.) on the six-story library glass wall above the reflecting pool. (Photo courtesy of Basil Tsimoyianis) Oakland, Calif.-based “vertical dance” company BANDALOOP performs in Sydney, Australia. They will be appearing at the Utah Arts Festival June 21-24, and will perform twice daily (5:30 and 7 p.m.) on the six-story library glass wall above the reflecting pool. (Photo courtesy of James Adamson) Oakland, Calif.-based “vertical dance” company BANDALOOP performs in Dallas. They will be appearing at the Utah Arts Festival June 21-24, and will perform twice daily (5:30 and 7 p.m.) on the six-story library glass wall above the reflecting pool. (Photo courtesy of Basil Tsimoyianis) Oakland, Calif.-based “vertical dance” company BANDALOOP performs in Sydney, Australia. They will be appearing at the Utah Arts Festival June 21-24, and will perform twice daily (5:30 and 7 p.m.) on the six-story library glass wall above the reflecting pool. (Photo courtesy of BANDALOOP) Oakland, Calif.-based “vertical dance” company BANDALOOP will be appearing at the Utah Arts Festival June 21-24, and will perform twice daily (5:30 and 7 p.m.) on the six-story library glass wall above the reflecting pool. Photo courtesy of Jim Stone) Oakland, Calif.-based “vertical dance” company BANDALOOP performs at the San Francisco Public Canvas event. BANDALOOP will be appearing at the Utah Arts Festival June 21-24, and will perform twice daily (5:30 and 7 p.m.) on the six-story library glass wall above the reflecting pool. (Photo courtesy of Jim Stone) Oakland, Calif.-based “vertical dance” company BANDALOOP performs at the San Francisco Public Canvas event. BANDALOOP will be appearing at the Utah Arts Festival June 21-24, and will perform twice daily (5:30 and 7 p.m.) on the six-story library glass wall above the reflecting pool. (Photo courtesy of Katherine Barcsay) Oakland, Calif.-based “vertical dance” company BANDALOOP performs with pop star P!nk on the JW Marriott building in Los Angeles at the 2017 American Music Awards. BANDALOOP will be appearing at the Utah Arts Festival June 21-24, and will perform twice daily (5:30 and 7 p.m.) on the six-story library glass wall above the reflecting pool. (Photo courtesy of Katherine Barcsay) Oakland, Calif.-based “vertical dance” company BANDALOOP performs with pop star P!nk on the JW Marriott building in Los Angeles at the 2017 American Music Awards. BANDALOOP will be appearing at the Utah Arts Festival June 21-24, and will perform twice daily (5:30 and 7 p.m.) on the six-story library glass wall above the reflecting pool. (Photo courtesy of Katherine Barcsay) Oakland, Calif.-based “vertical dance” company BANDALOOP performs with pop star P!nk on the JW Marriott building in Los Angeles at the 2017 American Music Awards. BANDALOOP will be appearing at the Utah Arts Festival June 21-24, and will perform twice daily (5:30 and 7 p.m.) on the six-story library glass wall above the reflecting pool. (Photo courtesy of Basil Tsimoyianis) Oakland, Calif.-based “vertical dance” company BANDALOOP performs with pop star P!nk on the JW Marriott building in Los Angeles at the 2017 American Music Awards. BANDALOOP will be appearing at the Utah Arts Festival June 21-24, and will perform twice daily (5:30 and 7 p.m.) on the six-story library glass wall above the reflecting pool. (Photo courtesy of Basil Tsimoyianis) Oakland, Calif.-based “vertical dance” company BANDALOOP performs with pop star P!nk on the JW Marriott building in Los Angeles at the 2017 American Music Awards. BANDALOOP will be appearing at the Utah Arts Festival June 21-24, and will perform twice daily (5:30 and 7 p.m.) on the six-story library glass wall above the reflecting pool. (Photo courtesy of James Adamson) Oakland, Calif.-based “vertical dance” company BANDALOOP performs in Shanghai, China. 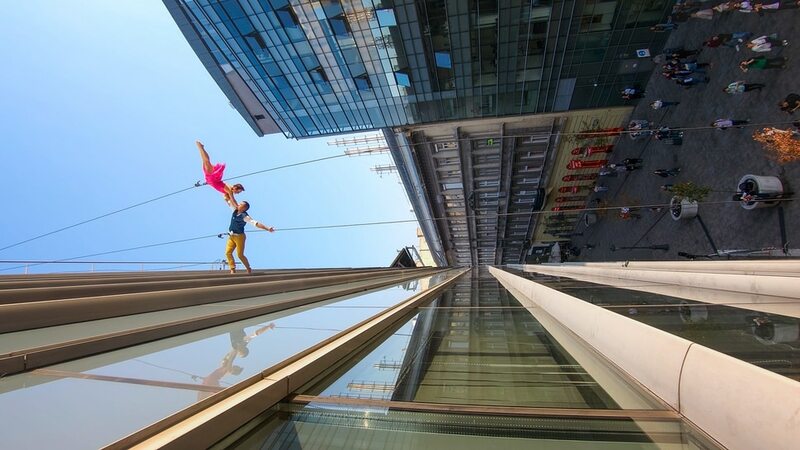 BANDALOOP will be appearing at the Utah Arts Festival June 21-24, and will perform twice daily (5:30 and 7 p.m.) on the six-story library glass wall above the reflecting pool. (Photo courtesy of Jessica Swanson) Oakland, Calif.-based “vertical dance” company BANDALOOP performs from the Sather Tower during Cal Day in Berkeley, Calif. BANDALOOP will be appearing at the Utah Arts Festival June 21-24, and will perform twice daily (5:30 and 7 p.m.) on the six-story library glass wall above the reflecting pool. (Photo courtesy of Basil Tsimoyianis) Oakland, Calif.-based “vertical dance” company BANDALOOP performs during Cal Day in Berkeley, Calif. BANDALOOP will be appearing at the Utah Arts Festival June 21-24, and will perform twice daily (5:30 and 7 p.m.) on the six-story library glass wall above the reflecting pool. (Photo courtesy of James Adamson) Oakland, Calif.-based “vertical dance” company BANDALOOP performs in Dallas. They will be appearing at the Utah Arts Festival June 21-24, and will perform twice daily (5:30 and 7 p.m.) on the six-story library glass wall above the reflecting pool. (Photo courtesy of James Adams) Oakland, Calif.-based “vertical dance” company BANDALOOP performs from Los Angeles’ City Hall building at the “La La Land” dedication day ceremony in April 2017. BANDALOOP will be appearing at the Utah Arts Festival June 21-24, and will perform twice daily (5:30 and 7 p.m.) on the six-story library glass wall above the reflecting pool. (Photo courtesy of Basil Tsimoyianis) Oakland, Calif.-based “vertical dance” company BANDALOOP performs during Cal Day in Berkeley, Calif. BANDALOOP will be appearing at the Utah Arts Festival June 21-24, and will perform twice daily (5:30 and 7 p.m.) on the six-story library glass wall above the reflecting pool. (Photo courtesy of BANDALOOP) Oakland, Calif.-based “vertical dance” company BANDALOOP will be appearing at the Utah Arts Festival June 21-24, and will perform twice daily (5:30 and 7 p.m.) on the six-story library glass wall above the reflecting pool. (Photo courtesy of Basil Tsimoyianis) Oakland, Calif.-based “vertical dance” company BANDALOOP performs in Sydney, Australia. They will be appearing at the Utah Arts Festival June 21-24, and will perform twice daily (5:30 and 7 p.m.) on the six-story library glass wall above the reflecting pool. Photo courtesy of Jim Stone) Oakland, Calif.-based “vertical dance” company BANDALOOP performs at the San Francisco Public Canvas event. BANDALOOP will be appearing at the Utah Arts Festival June 21-24, and will perform twice daily (5:30 and 7 p.m.) on the six-story library glass wall above the reflecting pool. “Airborne. Amplified. Upsized.” reads the headline on promotions for the 42nd annual Utah Arts Festival, which takes place June 21-24 at Library Square (400 S. 200 East) in downtown Salt Lake City. Well, the latter is easily discerned, given that this year’s festival boasts its largest Artist Marketplace to date, with 175 visual artist booths featuring ceramics, jewelry, metalwork, painting, photography, sculpture, wearables and woodworking. The middle component, meanwhile, references the festival’s new Arts Fest Amplified concert series — one headlining show each night on the Amphitheater Concert Stage inside the festival, including Ron Pope and Gomez, A-Trak, People Under the Stairs, and St. Paul and the Broken Bones. What, though, is the “airborne” all about? That would be BANDALOOP, a “vertical dance” company from Oakland, Calif., which will perform eight — count ’em, eight — choreographed routines across and down the sheer glass façade of the Salt Lake City Main Library with the help of rock-climbing rigging and rappelling harnesses. Oh, and lest we forget, the festival also includes literary arts performances, visual arts workshops, a fine arts exhibition, roughly 60 screenings of short films, Art & Technology and Urban Arts programs, and a children’s Art Yard. Among other things. When • June 21-24, noon to 11 p.m.
Where • Library Square, 200 E. 400 South, Salt Lake City. Tickets • Available at https://www.uaf.org/tix and the box office. Adults, $15; Thursday/Friday lunchtime special, $8 (noon-3 p.m. only); seniors (65+)/military, $8 (at box office only); children 12 and younger, free; four-day Festival Pass, $50; Arts Fest Amplified, $25 (includes same-day festival admission). BANDALOOP performances • Twice daily at 5:30 and 7 p.m. Speaking of things that tick, if watching BANDALOOP make its dynamic descent down the five-story, curved glass wall gets your heart racing, well, you wouldn’t be alone. It certainly does the trick for Melecio Estrella, and he’s BANDALOOP’s associate artistic director and a performer in the group for the past 15 years. (Photo courtesy of Katherine Barcsay) Oakland, Calif.-based “vertical dance” company BANDALOOP performs with pop star P!nk on the JW Marriott building in Los Angeles at the 2017 American Music Awards. BANDALOOP will be appearing at the Utah Arts Festival June 21-24, and will perform twice daily (5:30 and 7 p.m.) on the six-story library glass wall above the reflecting pool. Members of the group are first taken on as apprentices before eventually becoming new company members, but even then, Estrella said, it usually takes about three years of work — building up “an unusual amount of core strength,” learning to balance “horizontal body orientation” with freedom of movement in the head, spine and limbs, and developing the ability to recognize obstacles and challenges (such as windowsills, turrets, signage) and turn them into “creative opportunities” — before they are dropped into actual performances. 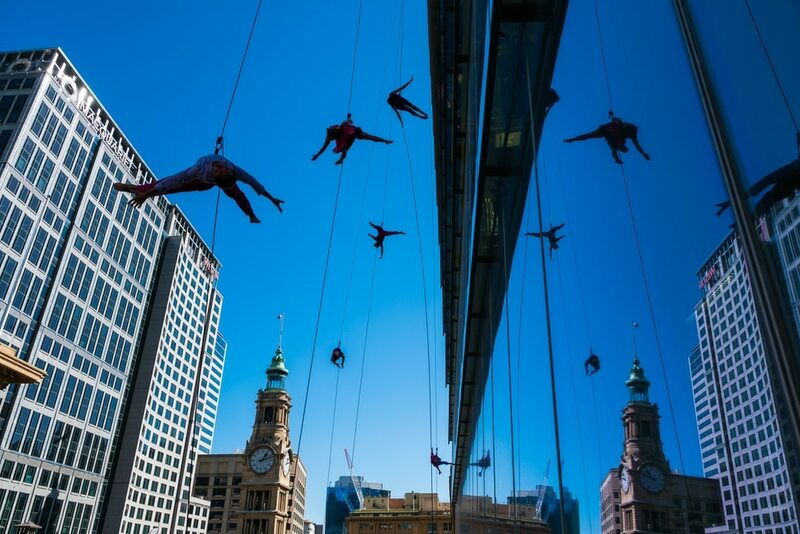 BANDALOOP, which was formed in 1992 by artistic director Amelia Rudolph, now dances all over the world, from San Francisco to Shanghai to Sydney. Nevertheless, Estrella said the company has a strong affinity for Salt Lake City. (Photo courtesy of Basil Tsimoyianis) Oakland, Calif.-based “vertical dance” company BANDALOOP performs in Sydney, Australia. 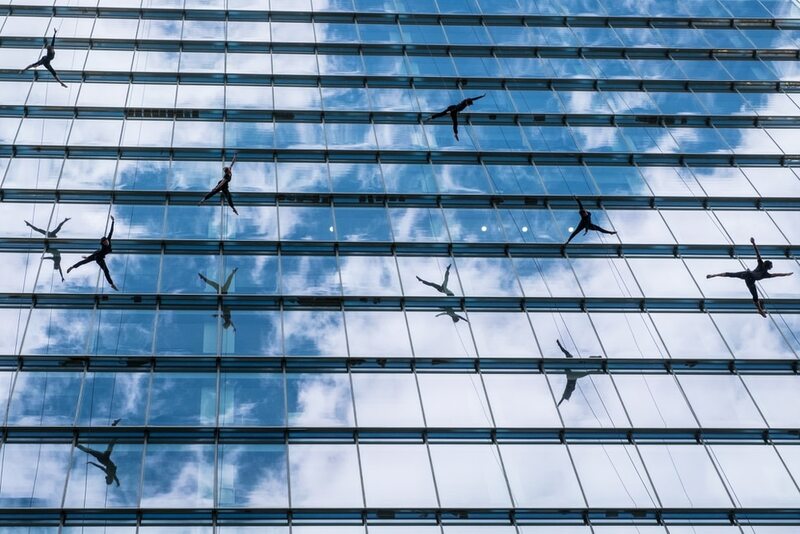 The company will be appearing at the Utah Arts Festival June 21-24 and will perform twice daily (5:30 and 7 p.m.) on the six-story library glass wall above the reflecting pool. Sewell was an early advocate for the group after reading about it and seeing pictures in a magazine in the late 1990s. While she advocated for the festival’s then-director to bring BANDALOOP in, she recalls not everyone being enamored of the idea. While previous years’ headlining musical performances at the Amphitheater Concert Stage were included in the price of a festival ticket, this year’s performances will cost you an extra $10. Arts Fest Amplified Tickets cost $25, which also includes same-day festival admission. There’s a good reason behind the change this year, said Utah Arts Festival executive director Lisa Sewell.